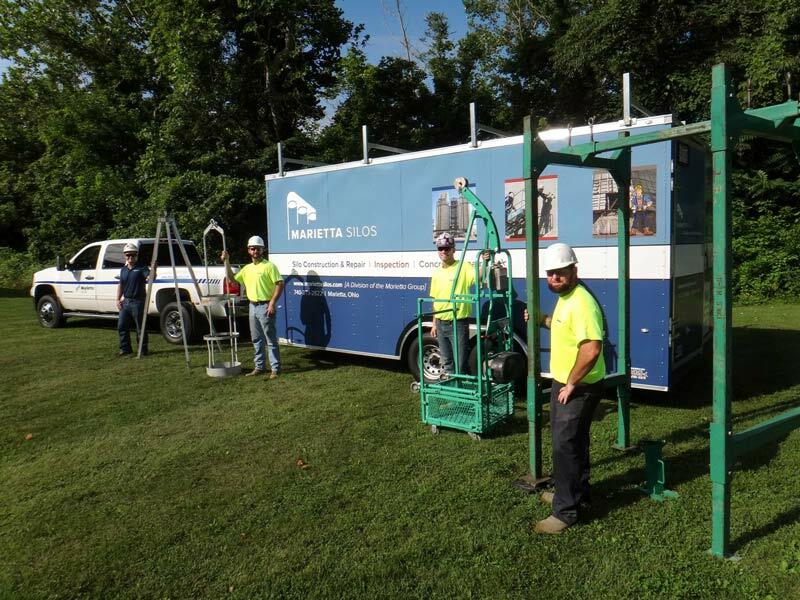 Marietta Inspection Services and Marietta Silos can now work in tandem to complete inspections and repairs in one mobilization. Inspections and most repairs can be finished using common materials and some pre-engineered solutions adapted from years of silo industry experience. Combined inspection and repair saves you thousands through eliminating redundant labor and multiple trips and gets your silo running safely again faster. Our new mobile staging trailer is configured to transport instrumentation, tools and support equipment needed in the field to ensure the safety and efficiency of our field crews. Included in our standard on-site equipment package are all materials and equipment required to maximize personnel safety in accordance with the OSHA Confined Space Standard 29 CFR 1910.146. In the trailer we transport all of the necessary equipment to go through the silo interior during inspection. In addition, the trailer also carries equipment to install hanging inspection baskets to the exterior of the silo used to raise and lower an inspector from grade to the roof at any area on the silo exterior. We include a full array of inspection equipment including concrete testing equipment, steel thickness measuring devices, and equipment to detect delamination on concrete and concrete walls. To safeguard our inspectors, we provide air monitoring equipment to ensure that the environment that the inspector is being lowered into is safe for human access. Also included is equipment for emergency retrieval. If requested, we can stock the trailer with some silo repair equipment and materials so we can do small repairs on-site at the time of inspection. This option can save the customer a tremendous amount of money and downtime. Our branded trailer serves as a focal point for Marietta Silos field staff, customer facility personnel and independent contractors who collaborate with us on silo construction, inspection and safety presentations throughout the United States. Schedule your next inspection or contact us directly.